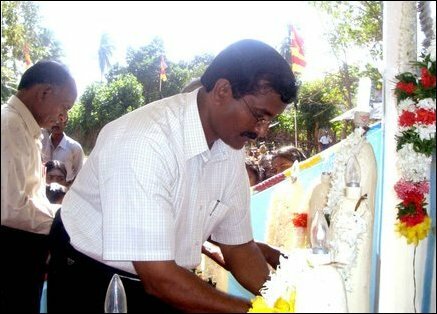 14th death anniversary of nine innocent Tamil civilians who died in aerial bombing by the Sri Lanka Air Force on 4th February, 1991 at Koolavadi, Uruththirapuram in Killinochchi district was observed Friday, Vanni sources said. Mr.T.Arunthavachelvan, Head of the Uruththirapuram Zonal Resurgence Forum presided of the event held at the monument for the dead on that day. Mr.Thirumaran, Head of the Killinochchi District National Resurgence Forum lit the flame of sacrifice, sources said. Mr.S.Thangan, LTTE Deputy Political head hoisted the Thamileelam national Flag and garlanded the monument. Relatives of the dead later paid homage to their loved ones.